Explore molecule shapes by building molecules in 3D! How does molecule shape change with different numbers of bonds and electron pairs? Find out by adding single, double or triple bonds and lone pairs to the central atom. 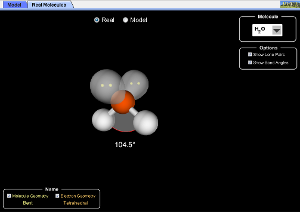 Coming Soon: A Real Molecules tab, where you can compare the VSEPR model to real molecules! Describe molecule geometry in terms of shape and bond angles. This simulation is really fun to play with, and lets students visualize electron replusions (both bonds, and lone pairs) and show bond angles. It's a small enough download that students can use it in class or as homework, and the 3-D visuals let them see molecule geometry without the limitations of particular modeling kits. I'm using it this fall in Gen Chem 1 recitation, in combination with the PhET sim on Polarity. Makes a great lecture demo as well, if you use a computer and projector in class. Everything is "drag-and-drop" with the mouse, so no instructions are needed (yes, it's that simple). It goes great with existing activities / homework / practice problems on VSEPR, or you can use it for an activity of your own invention. This (and every) PhET sim is completely free, supported by NSF. Note: as of 10/19/11 this sim is not working for some Windows XP machines. PhET is working on the problem and hopes to have it resolved soon. This is a neat applet that quickly shows the effects of adding additional bonded pairs or lone pairs to a central atom. Its fun (and yes, you don't need instructions!). I can see giving this to my first year students to play with. I like how you can turn on and off the molecule and electronic geometries, so they can guess the name and then check their answer. My one concern is that it seems that lone pairs are the "same size" as bonding pairs. We teach that lone pairs are larger, so the bond angle in SO2 or H2O is less than 120° or 109.5°. Is there a way to build that into the applet? Other than that, looks great. We've been getting lots of comments about the lone pairs not taking up more room than a bond. The trouble is, how much extra room would a lone pair take in a generic model? It's different depending on atom electronegativities in different molecules (H2O is 104.5, H2S is 92.2), so we are building a second "real molecules" tab that will have the correct bond angles for students to compare to the model. We wanted to release this as it is at present for teaching geometry in the meantime. When I teach VSEPR to my first year students, I tell them that they can't use this theory to predict actual bond angles, but you should be able to predict that it is, say, less than 120° or less than 90°. So, I would love it if you (in addition to the "real molecules" you describe, which would be great) maybe added a 2nd applet (or a window within this one) where you could model lone pairs as being "bigger" than bonding pairs, even if by only 5-10°. Or, maybe you could have a slider that varied it from ideal (0°) up to some maximum value (say 25°?). I'm not a programmer so I have no idea how hard this is. But it would be a great addition to an already great applet! Thanks for sharing this. I used the applet last week in my general chemistry class to introduce VSEPR geometries to the students. I think the students really benefited from seeing the geometry change as I brought in electron pairs. I'm conisdering making it part of a modeling lab that we do with VSEPR. I'd echo the comments made about the lone pairs and I'm looking forward to seeign the "real molecules" tab. Thanks again! I have to say that I rather like the fact that the lone pairs are "idealized", being the same size as the bonds. I think the important value of VSEPR is in rationalizing these idealized geometries. VSEPR is a very basic model, and is very good for what it does, but it doesn't have much predictive power. Rather than trying to force VSEPR to do the work of a "grown up" model, it's best to switch to talking about orbitals before addressing deviations from ideal geometry. "Big lone pairs" would predict that H2S would be nearer to 109.5 than water is, because it's less sterically crowded than water.